A wonderful way to give thanks to the people who have made a difference in our lives. 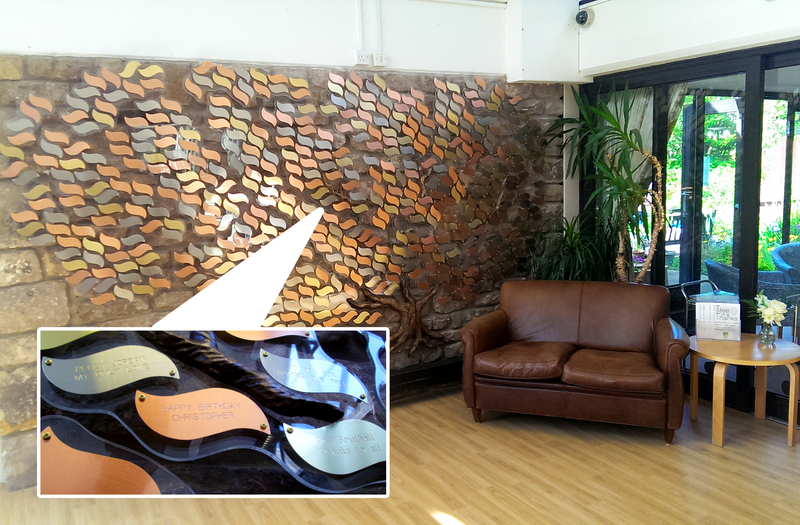 Our beautiful ‘Tree of Thanks’ stands proudly in the main reception area at the heart of St John’s Hospice. Adorned with copper, silver and gold leaves this is a tree like no other. There are so many times that we get asked by people who have been touched by the work of the hospice how they can help. By dedicating a leaf on our tree to a loved one or a friend, or by leaving a simple message of thanks to someone who has made a difference in your life, you will be helping to sustain and grow the hospice services. In return we can thank you for your kindness and support by engraving your special message on a leaf to be displayed on the tree. Every single leaf purchased will help to pay for the costs of care for our patients and their families. Your donation will not only help today but means you will be part of our future.